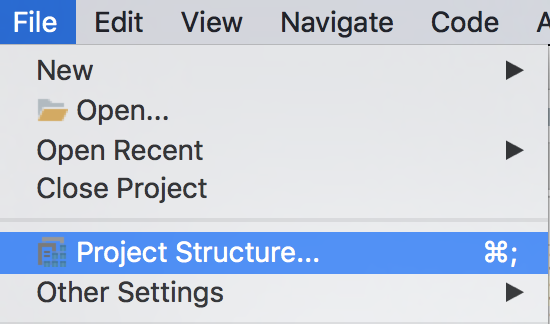 In this post, I'm going to continue with how to open AOSP and get IntelliJ support, Part 2 covered how to build AOSP, this part is how to open it in IntelliJ so you can navigate the codebase using a familiar editor similar to how you write apps. 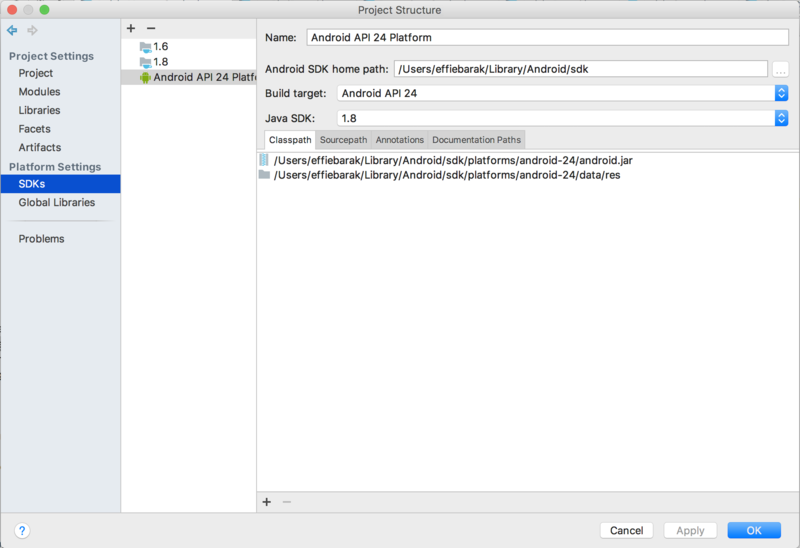 I tried getting the project to open with Android Studio as well, and got pretty close to the same result I did with IntelliJ, but ultimately IntelliJ provided better environment support than AS. These are the very minimum steps you'll have to go through in order to get basic support from the IDE (i.e to not see a page full of red lines and get basic navigation to/from classes). 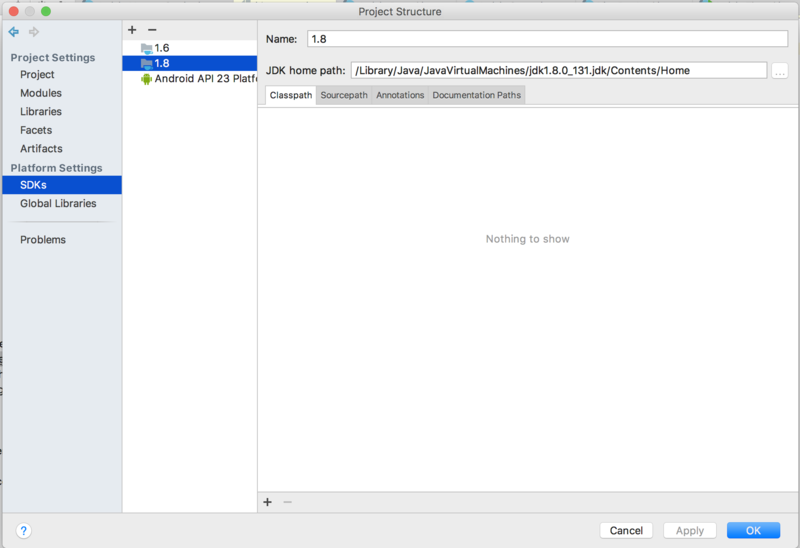 Open the generated android.ipr with IntelliJ and wait ~20 minutes for indexing to complete. These adjustments will make even more errors and red lines go away and will result in way friendlier coding environment. 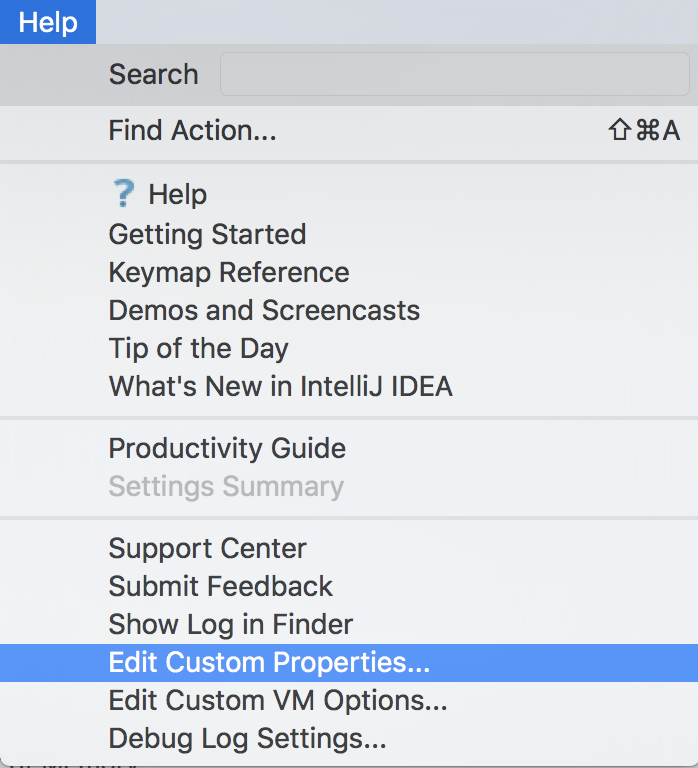 Go to Help -> Edit Custom properties. Create the file if prompted to do so. 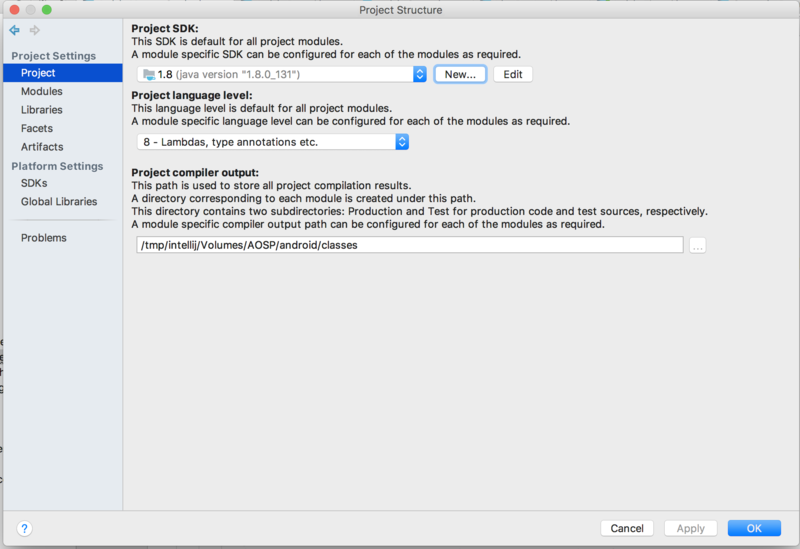 This is to help with basic language intellisense, and to eliminate resources not identified errors. Remove all the jars from the list in the 'Classpath' tab. Go to the Modules tab, and in Sources tab navigate to out/target/common/R folder. Right click on it and click Source. Apply. 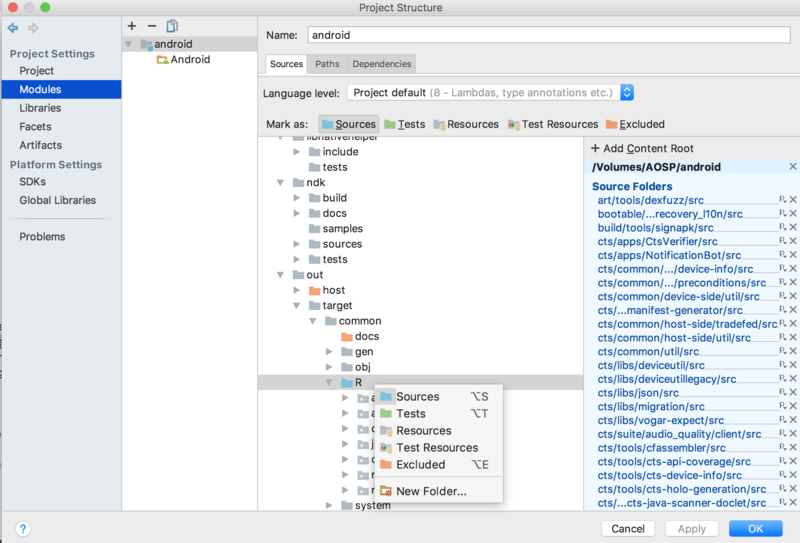 In the same Modules tab open Dependencies tab, remove all the dependencies, and choose the Android SDK as the module SDK. This is to help with the errors of "this API is only available above a certain SDK level"
These are the basic stuff I did, there are probably many more tweaks possible to this process (for example, there could be other other resource directories not marked as such) so play around until you reach an acceptable level. 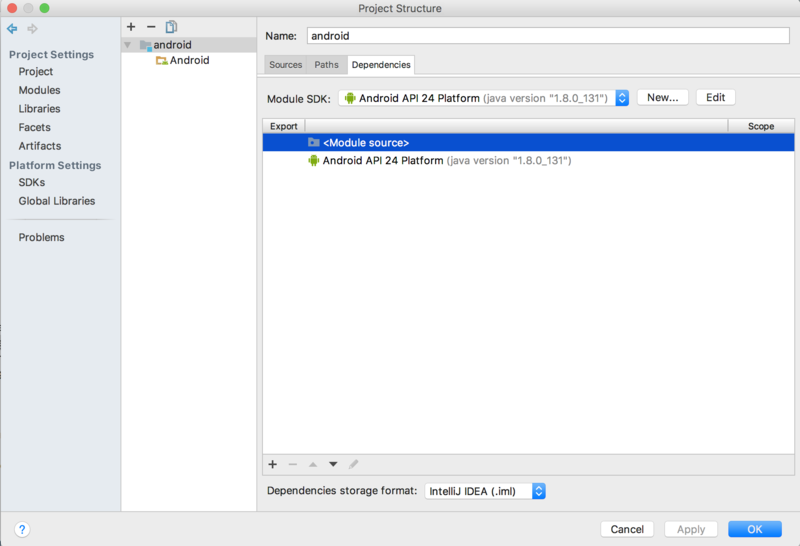 Building AOSP on a mac - part 2 Will Android kill single activities in case it runs out of memory? 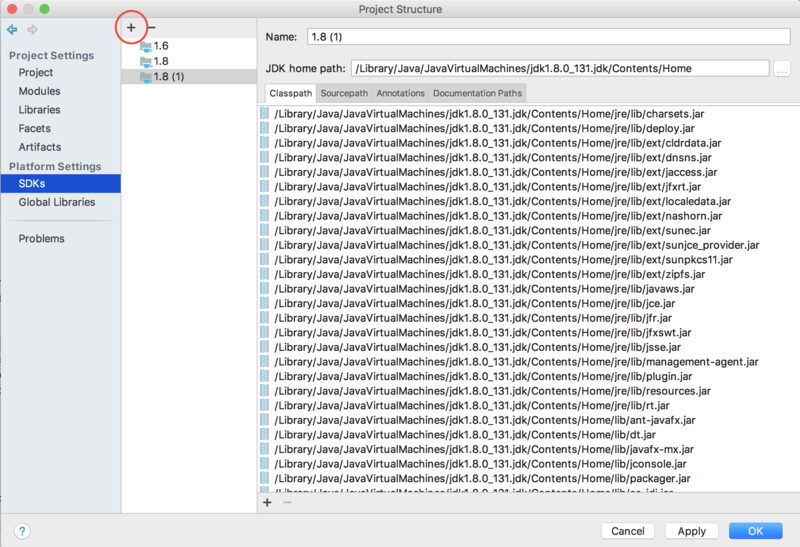 © 2019 Opening AOSP with IntelliJ - part 3. All Rights Reserved. | Built with Ghost and Caffeine Theme.